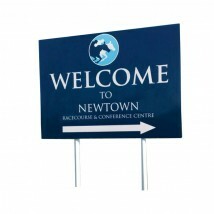 Our range of outdoor sign holders are designed to offer you a way to professionally present your information, directions, advertising and branding across any type of outdoor event. 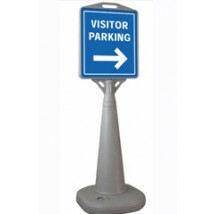 These sign stands are made from top quality materials designed to withstand the elements. Perfect for festivals and sporting events such as golf days, football & rugby tournaments and running races. Our outdoor sign displays come with the option to add custom printed graphics, which are produced in-house to ensure a top quality finish. 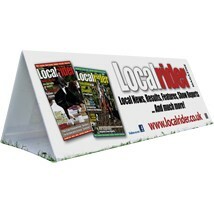 As well as our range of indoor signs, we have a specially picked range of holders and stands for outdoor signage, perfect for events and outdoor promotional space. 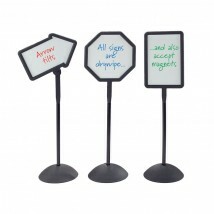 These sign stands are a versatile signage solution that allows the user to easily change the sign when they need a different message to be displayed. They are constructed from special water and weatherproof materials to stand up to the elements rain or shine. One thing to consider when choosing your external signholder is the base type, which in turn depends on the surface you are placing the holder onto. 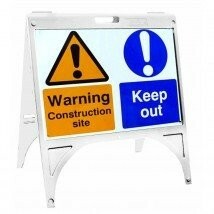 Water-based outdoor sign stands are ideal for temporary signage, They have a moulded plastic base which is weighted by adding water or sand to make them stable. The advantage is that they can be used on hard standing such as car parks to direct the flow of traffic as well as grass. 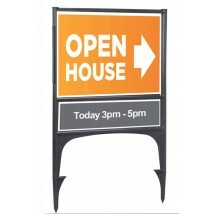 One drawback is that they are less portable than the other types of sign holder used outside. 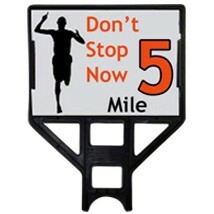 Stake sign holders comprise a durable weatherproof moulded plastic frame which has integral stakes that can be pushed into the soft ground. They are portable and have the benefit over wooden stakes of being quicker to install and the added advantage of being reusable. 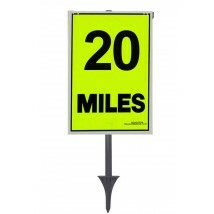 These sign frames are usually used in conjunction with printed Correx signs which are cheap, lightweight and weatherproof. We also have a prism type sign that is made from Correx and can be used on any flat surface, making it an extremely versatile option when considering your outdoor signage solution. 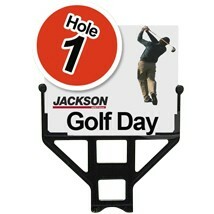 Over the years our customers have used outdoor sign holders for all manner of applications. One popular use is for professional event organisers to inform and guide the public at music festivals, sports events, fairs, country shows and are also popular with schools when they have open days and sports days. 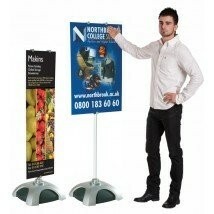 If you need help choosing an outdoor sign holder please call us on 0844 800 1020 for friendly, expert advice. 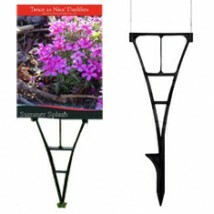 Providing the artwork for your chosen outdoor sign holder is a painless process. Once you have placed your order you will be sent an email with easy to follow instructions on uploading your files securely. On your chosen product you will find any relevant templates and artwork specifications, but if you need help or have questions about your files please call us on 0844 800 1020 to speak to our print team. If you don't have artwork and need some created for your sign, then look no further than our bespoke in-house design service. We will work from your design specification to produce a print ready file that will make your outdoor sign look professional and eye catching. Once you have approved your design it will be sent to our print studio for fast delivery, giving you full control of the process from start to finish.